Colin Kaepernick, the quarterback for the San Francisco 49ers, caused a firestorm of controversy over the weekend when he remained seated during the national anthem. The media on the left and the right both went for blood. However, surprisingly the team stuck with him, noting that there is no requirement for players to stand during the anthem. 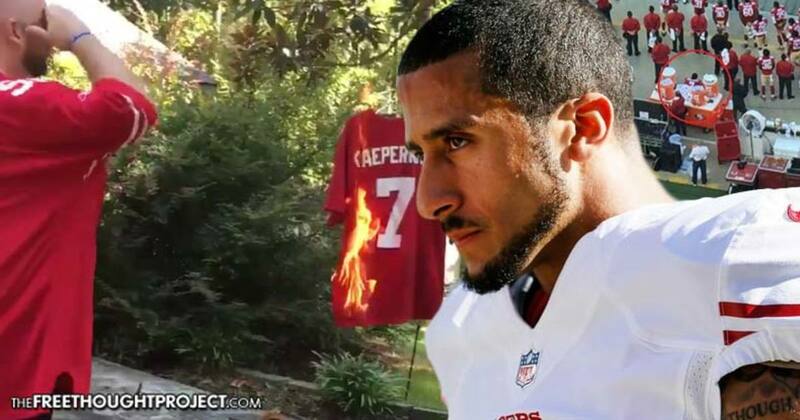 In spite of death threats, fans burning his jersey, other NFL teams jumping on the hate bandwagon, and media pressuring him to apologize, Kaepernick remains steadfast in practicing his free speech to raise awareness to a growing problem in America today. Almost immediately after Kaepernick was seen sitting for the anthem, veterans and staunch nationalists, who could apparently not care less about the state of police in America, took to hammering the quarterback. People called him a disgrace and said he was ignorant and disrespectful to the sacrifices of American soldiers. Instead of allowing the media and haters of free speech to dictate his sentiment, however, Kaepernick noted that his actions are not out of disrespect. “I have great respect for the men and women that have fought for this country,” said Kaepernick. “I have family, I have friends that have gone and fought for this country. And they fight for freedom, they fight for the people, they fight for liberty and justice, for everyone. That’s not happening. “People are dying in vain because this country isn’t holding their end of the bargain up, as far as giving freedom and justice, liberty to everybody. That’s something that’s not happening. Conveniently, the nationalistic backlash failed to address the veterans who’ve been killed by police as referenced above. Anthony Hill, 27, was unarmed and naked when he experienced a psychotic episode and a trigger happy Georgia cop then filled him with holes. It’s not just veterans of color either. West Monroe Police Officer Jody LeDoux was caught on video shooting and killing homeless veteran, Raymond Keith Martinez, 51, in December. Martinez was unarmed and posed no threat. Only a couple of weeks after Martinez was killed, Nicholas McGehee, 28, a celebrated purple heart recipient, was killed after his wife called 9-1-1 for a medical emergency. On Mother’s Day in 2014, Tommy Yancy, 32, a veteran who suffered from PTSD and served in Afghanistan and Iraq in the 259th Field Service Unit following the 9/11 attacks, was savagely beaten to death, in horrific brutality caught on camera. Last year, we reported on new documents which show that the Palm Springs Police Department admits they were at fault in the death of Allan ‘AJ’ DeVillena II, a High Desert Marine who was shot to death on Veteran’s Day weekend. None of these men have received any justice. Where is the outrage from the nationalists for these men? Sadly they are silent, because standing against the state is only okay when it’s directed against whatever divisive puppet is in the white house. Jumping on the bandwagon and participating in two minutes of hate is the easy thing to do. Refusing to challenge the collective for fear of ridicule and rejection is what leads to tyranny. Kaepernick’s actions, while viewed by many as cowardly, are quite the opposite and are the groundwork for a free society. Calling for him to be silenced, however, like so many have already done, is the work of despotism. The bravery and courage illustrated by Kaepernick in this matter are most certainly admirable and he deserves commendation. That being said, to be truly effective, he should take it a step further. Kaepernick, like so many before him who call for an end to police brutality and killings, fails to address one of the root causes of so much of this suffering — the war on drugs. If you honestly believe that black lives matter, it is your duty to call for an end to the drug war. And if police honestly want to prevent violence, it is their duty to refuse to enforce immoral laws that criminalize arbitrary substances and personal choices. Tasking police with enforcing this ridiculous war creates constant hostile interactions. Remove the drug war and remove most of these confrontations — thereby fostering peace. We can look at the prohibition of alcohol and the subsequent mafia crime wave that ensued as an example. The year 1930, at the peak of prohibition, happened to be the deadliest year for police in American history. 300 police officers were killed, and innumerable poor people slaughtered as the state cracked down on drinkers. When the people’s freedoms to do as they wish without harming others become threatened, the people lash out. This can be seen throughout history. Hopefully, Kaepernick and others continue to force this conversation into the forefront — and end this violent cycle once and for all. And Kaepernick, if you are reading this, I am a veteran and I support your bravery. Standing up for the national anthem is not what fosters freedom — standing up to the tyranny of the state does!